Think of an MBA in Europe, and IE Business School in Spain immediately strikes one as a top option, not just in the region, but around the world. Ranked #11 in the World (FT ranking 2013), the program rates highly in comparison to other comparable programs in Europe, such as INSEAD and IMD. The European economy in general and the Spanish economy in particular, though, have caused some concern in the minds of potential applicants. 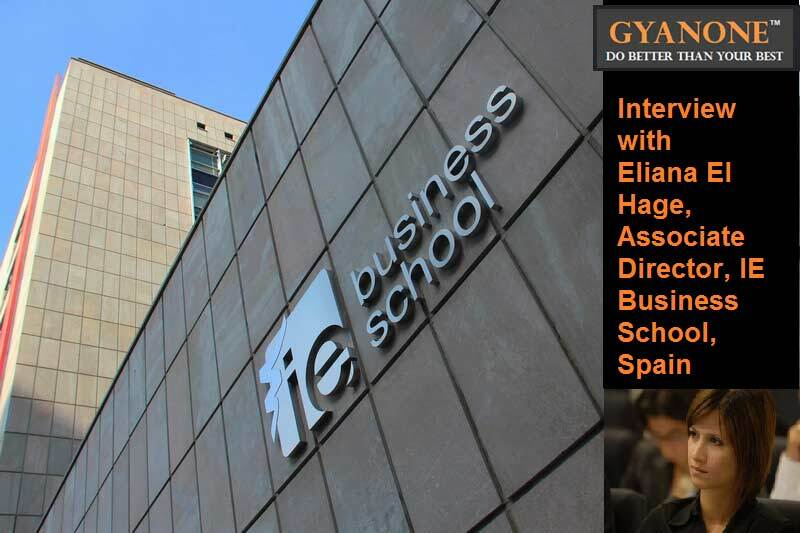 In this interview with GyanOne, Eliana El Hage, Associate Director at IE Business School, discusses the school’s value proposition, career opportunities in Europe, IE MBA Admissions, and career statistics at IE Business School. Thank you, Eliana, for your time, and your perspectives! GyanOne: IE Business School has been in the FT top 10 consistently and is considered one of the best options for an MBA in Europe. What are the USPs of the program for international applicants? GyanOne: While rankings help, in recent times there has been concern over post-MBA opportunities at IE Business School because of the prevailing economic situation in Europe in general and Spain in particular. How has this impacted the scenario for IE graduates? Eliana El Hage, IE MBA Admissions: IE is very international and we receive students from more than 80 countries every year. Our Careers Management Center knows well the profile of our students and gives them the adequate training to be able to land a job anywhere in the world. Equally international are our programs, we don´t focus on one single region, we give cases from all over the world. GyanOne: Being able to work in Europe post completion of the program is an important consideration for international students coming to IE Business School. How easy is it for an international student to find a top job in Spain and build a solid career there? Eliana El Hage, IE MBA Admissions: Unfortunately nowadays it is a bit difficult to get a job in Europe or Spain due to a tough and long visa process. However, it is not impossible. Many of our students end up in top jobs in Europe or Spain. My advice is to learn about the visa processes as soon as you land in Madrid, and start networking with top companies from day 1 of the program. GyanOne: IE Business School offers a plethora of options to applicants looking for business education at the Master’s level. For instance, a finance professional with some experience can consider the full-time MBA, Masters in Finance, or Specialized Programs. What are the factors that can help an applicant choose best? Eliana El Hage, IE MBA Admissions: The candidates should really know where they want to be after they finish their program. It´s not always an easy choice though. Just to simplify it, for example someone who is really passionate about Finance and who would like to become an investment banker after doing his/her program should definitely do a Master in Finance. On the other hand, someone who likes finance but is as well open for jobs in consulting or business development should maybe consider an MBA (if he/ has more than 3 years of work experience) or a master in management (if he/she has less than two years of work experience). GyanOne: What are the key characteristics that IE looks for in an MBA applicant? How important is the GMAT score / academic score (undergraduate) in deciding on admission? How important is it to have community service experience? Eliana El Hage, IE MBA Admissions: The most important characteristic for us is the fit! We need someone that can fit with the IE culture = Motivated, with an international mindset, and with an excellent profile academically and professionally. As well we want to see how this MBA fits in your future career plans. We have a holistic approach which means that we look at everything from undergraduate grades, to the GMAT scores, to the professional experience, social work, interview and so on. At IE, your test scores are as important as your personality and attitude, that´s why all of our students are interviewed before getting their final admission. GyanOne: How important a factor for IE MBA admissions is diversity? Applicants from the IT sector tend to feel they are at a disadvantage because of this. Is this true? What can IT applicants do to improve their candidacy? Eliana El Hage, IE MBA Admissions: As previously mentioned, IE is very diverse in terms of backgrounds, so in a typical class we would of course have people with a business background, but as well engineers, lawyers, biologists and event artists. So all profiles are welcomed and we believe that every person can have a special contribution to the class. To improve their candidacy, IT applicants should show professional growth and improvement. So their CV and career advancement are very important. GyanOne: What are the top three consistent mistakes you see people make in their applications? – We don´t like clichés. We read so many applications, so to remember you, you have to be special and be yourself. We don´t want people telling us what they think we want to hear. – Don´t let anyone write your essays, we can guess when someone helped! – Many candidates apply to various schools at the same time and copy and paste their answers from their various applications. We want students to answer our questions instead of giving general vague answers. GyanOne: The IE Global Admissions Test is an interesting alternative to the GMAT/GRE. What is the thinking behind having this alternative? Why have separate tests when the GMAT/GRE are available? How do you benchmark the performance of applicants on the IE Global Admissions Test against that of other candidates on the GMAT/GRE? Does taking the IE Global Admissions Test give an applicant an edge in the admissions process? Eliana El Hage, IE MBA Admissions: For us the GMAT/GRE or the IE Global Admission Testare evaluated the same way. Thus taking any of the tests is equally valid for us. We have our own admission test especially for people who are not interested in sectors that require the GRE or GMAT such as consulting and finance. GyanOne: What are career statistics like? Which sector or location do most graduates find jobs in? GyanOne: Consulting, including IT consulting, is a favored career option for international students, especially those from the Asia Pacific region. How strong is the environment at IE for students looking at a career in consulting? How easy is it for students with non-consulting backgrounds to make a move to consulting? Eliana El Hage, IE MBA Admissions: Our statistics show a total number of students that landed a job in consulting but unfortunately we haven´t break them further down, so we do not know about the percentage of IT consulting. 15% of the students that joined the program had a background in consulting and 21% secured a job in consulting post MBA which reflect how students can change industries. Consulting is the typical industry where is more important for recruiters to identify talent and potential in candidates, and not so much previous experience in consulting.